oneNetwork, who launched a robust software affiliate program earlier this year, has announced that oneNetwork Affiliate Program 2.0 is here. Ad Pools - oneNetwork now will allow affiliates to test multiple banners at one time and the system will automatically serve the banner that maximizes commissions. Creative - oneNetwork 2.0 allows vendors to upload unlimited creative in many different forms including flash and e-mail templates. Software Titles - They've recently struck deals with some of the largest software publishers in the industry. These programs will not be available for sale through the existing oneNetwork 1.0 platform. Any affiliates that already had an account with oneNetwork will now have an account in oneNetwork 2.0. The username/affiliate id is the same as on the existing oneNetwork affiliate id but has been pre-pended with "rn_a". For example, if your current affiliate id is 32338, your new oneNetwork 2.0 affiliate id is rn_a32338. 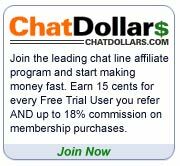 Go to http://affiliates.digitalriver.com and enter your Affiliate ID and password at the top of the screen. Below are the Top Ten Affiliate Programs for October 2005 as tracked by the AffiliateTip.com Affiliate Program Directory. I was pouring through my logs this morning, and I was curious about the locations of visitors to my affiliate marketing related sites. Taking a look at the visitors to affiliatetip.com , affiliatemanager.net , and affstat.com , an overwhelming portion of the traffic came from the U.S., as one might expect. Next up were Canada and the UK respectively. Rounding out the top five were Australia and Japan. Below is a list of the top twenty affiliate marketing countries, not officially, but as reported in my logs. New York, October 24, 2005 - Performics, the performance-based marketing division of DoubleClick Digital Advertising Solutions, today announced the incorporation of the MSN adCenter API into its search engine marketing platform as well as the participation of more than 100 advertisers in the adCenter pilot, which began in the U.S. on Oct. 18, 2005. The MSN adCenter API allows Performics and other advertisers to connect their technology into the adCenter platform, enabling programmatic end-to-end account management as well as direct access to MSN's audience intelligence tools. "Performics has been extremely valuable throughout our development process. The company provided unique insight and perspective because of the massive scale of its search marketing programs and the high level of sophistication and functionality of its technology platform," said David Jakubowski, general manager of search strategy and GTM for MSN. "We look forward to working closely with Performics as we take search to a more sophisticated, targeted level." With more than 420 million unique visitors per month worldwide, MSN presents an exciting opportunity for Performics' clients looking for new opportunities during the fourth quarter. Performics will leverage the adCenter API to integrate technology, access preferred service, and utilize automated advertising purchase and management processes to ensure all of its advertisers will be able to rapidly scale their programs to include adCenter. "adCenter is an important innovation for the search marketing industry," said Stuart Larkins, vice president, search for Performics. "Being one of the first advertisers to reach the MSN user base really struck a chord with our search advertising clients. We welcome another major player that can help bolster our clients' search marketing programs through the holiday shopping season, and adCenter's audience intelligence and targeting capabilities are very attractive for our sophisticated search advertisers." Performics is part of an exclusive group of search engine marketing companies participating in the pilot program. As part of the alpha and beta testing, Performics provided feedback and direction on the needs of search advertisers, coupled with the requirements of third parties for more seamless technical integration. By running on adCenter, Performics' search advertisers gain flexibility and control and a better understanding of how to connect with searchers on MSN and the Internet. Performics is the performance-based marketing division of DoubleClick Digital Advertising Solutions and is a leading provider of Affiliate, Search and Data Feed Marketing Solutions. DoubleClick Digital Advertising Solutions, an operating unit of DoubleClick, provides technology and services that empower marketers, agencies and Web publishers to work together successfully. Its focus on innovation, reliability and insight enables clients to improve productivity and results. Since 1996, DoubleClick has empowered the original thinkers and leaders in the digital advertising industry to deliver on the promise of the rich possibilities of our medium. Today, the company's DART and Performics divisions power the digital advertising marketplace. Tomorrow, it will continue to enable clients to profit from opportunities across all digital advertising channels as consumers worldwide embrace them.